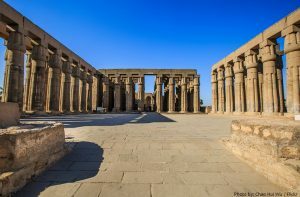 People tend to think that Egyptian building styles stayed the same for the whole period of Ancient Egypt, from the beginning of the Old Kingdom to the end of the New Kingdom two thousand years later, but that’s not true. The Egyptians built different kinds of buildings at different times, just like any other group of people. In the early part of the Old Kingdom, the Egyptians built mainly mastabas, a kind of tomb with a flat roof like a house. Then throughout most of the Old Kingdom, the Egyptians built the pyramid tombs which are now so famous. Of course they also built smaller buildings like houses and butcher shops. In the Middle Kingdom, the mastaba tomb came back again, although in a more elaborate form for the Pharaohs. None of them built any more pyramids. Then in the New Kingdom there was a lot of building that was not tombs: temples for the gods especially, but also palaces for the Pharaohs. You could compare these New Kingdom temples, with their columns mainly on the inside of the walls, to buildings from Shang Dynasty China, about the same time, where the columns are around the outside. Cite this page: Carr, K.E. Egyptian Architecture. Quatr.us Study Guides, May 18, 2017. Web. April 18, 2019.